I must say, I’ve kept rather quiet about what has been happening in my life over the last two weeks. The whole of this month has been a whirlwind of battles and victories; of God speaking very directly to my heart about my priorities and desires; of God showing Himself as a wonderful provider; and one very real revelation: He wants to give us good gifts, He wants to give us the desires of our hearts (I’ll write on this last bit later…you’ll see it entitled “Good Gifts” – I just don’t know when I will write it yet). Leaving for California was admittedly a nice escape from the regular day to day. I was excited to forge new trails, to make new friends, and to find life in community in a place other than the one I have known for so long. What I didn’t really expect was to leave Bend and find my heart strung out along the highway all the way back home. I thought I had prepared enough mentally and emotionally not to face such a wrenching of my heart. What I didn’t expect was for God to so quickly tell me I was allowed to come home – though I imagined when He told me this it would be at the end of Spring Term. However, as my financial situation unraveled I found myself with a sizable chunk of tuition due on top of my bills and no way to pay for it all. Essentially this was because a part of my aid had fallen through, something I couldn’t have planned for. So, a few days ago Kelly flew down to Santa Barbara, picked me up and whisked me home in good old Liza (my car). I’m still adjusting to being home. We all know what a planner I am, so this little detour was not on my set of scheduled events. Ask those closest to me: it’s been a difficult bit of change to swallow, but I hope now to see the remainder of what God wanted me to learn from this. In the mean time I will enjoy being with my man, my family, my friends, the wonderful community here AND the snow. I’ve been thinking upon God’s ultimate goodness as fact the past couple of weeks and how it looks in my life. Often times we go through seasons of doubt and question because we don’t understand what God is up to. We lack answers to the “why” and we either react with obedience and diligence in seeking Him, or we waver on the precipice of doubt and worry. There may be other reactions or responses to our lack of understanding, but these are the places I usually go to. Plenty of unexpected events have occurred in my journey down here – things I am at a loss to explain. The housing issue, the sizable amount of tuition I was unaware I owed, not to mention the fact that I fell head over heels for a wonderful man before I left Bend (in case you wondered, I already labeled this one very good!). It’s difficult to call the first two instances God’s ultimate good because I don’t yet understand them. Of course when I look back at 2007 – the most difficult year of my life to date – I didn’t understand why I had to go through those trials until much later. I already wonder what lessons God has in store for this particular season of my life. Even the best laid plans still falter, as I am learning. 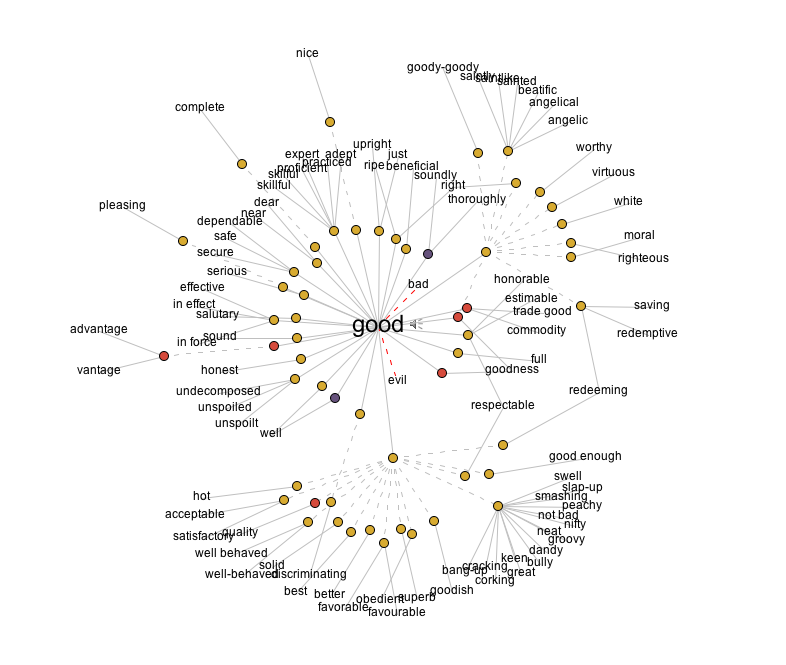 Visual Thesaurus Results for "Good"
Take that in for a bit. I’ll hit you with more thoughts on this tomorrow. It was a very unfortunate thing that happened yesterday: it seems I was told wrong about the information regarding my aid, and instead of having a surplus I actually owe on my tuition. I’m trying to take it all in stride and rely on the God who will provide in the midst of my circumstances. For it is Him who remains constant, and it is my choice and happy obligation (as one who loves Him) to rest in Him who is ultimately good until my circumstances change.